please call the office at 321-632-7085 at least one day ahead. We are busy with horses and customers all morning and afternoon every day. We most likely can not answer the phone or call back during that time. But you can leave us a message with your name and phone number and we will give you a call back as soon as we have time. We need to ask you a few questions in order to select your horse for you. Since the office phone is a landline we can not receive text messages. Also we don't take reservations by email. We cannot take riders younger than six years old or those who weigh more than 225lbs. 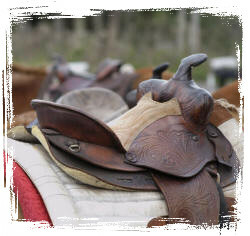 Reservations are required as we need to catch, groom and saddle your horse before each ride. When they are not out on the trail we allow our horses to run freely, to 'be horses' and do what horses do! Please arrive in allow ample time before your scheduled horse ride so you can meet your horse and get saddled (the ride times do not include mounting and dis-mounting). The current charge for a 1 1/2 hour guided trail ride is $40.00 per rider. ALL riders are required to complete a 'Release Form'.